Peace Ranch offers a full Natural Horsemanship curriculum, providing something for everyone—from beginners to advanced handlers. Instructor Melissa Edingfield is EAGALA Certified and has taught locally for over 20 years including performance, horse care, and Natural Horsemanship. 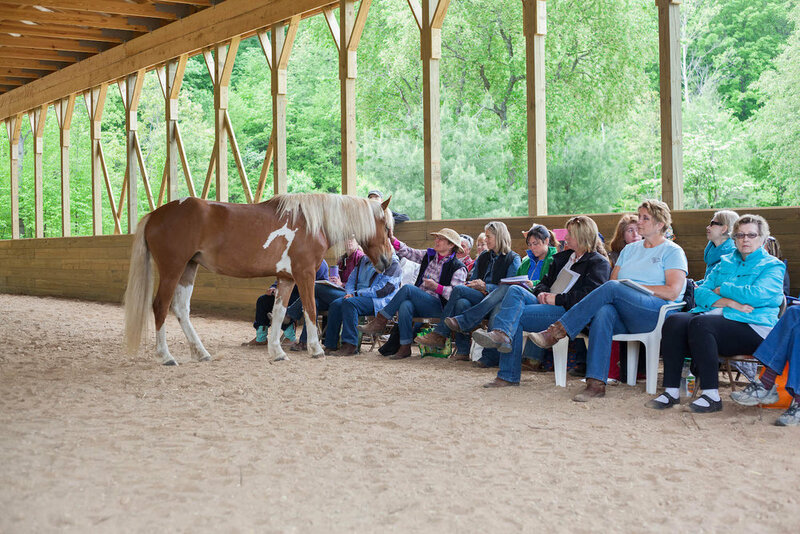 Melissa is well-known for her intuitive style and excellence in teaching natural equine communication methods. Sign up now as class size is limited and offered on a first come first served basis. All classes are on Tuesday or Thursday evenings from 6:30-8:30 p.m. Class cost includes horses and equipment. Due to liability issues, we cannot accommodate outside horses at this time. You can pay online via Paypal by clicking the buttons below. Please indicate which class(es) you are paying for in the “add special instructions” message box. You can also send a check to: Peace Ranch, 2570 Hoosier Valley Rd., Traverse City, MI 49685. If you need to make other arrangements, please contact us. Basics In Natural Horsemanship is an entry-level class for older teens and adults interested in learning about equine communication and herd dynamics. Sometimes called “Horse Whispering,” this class explores art of conversation with horses using their language with a focus on building vocabulary. Beyond Basics is a novice class which will help students advance to the next level in learning about equine communication and herd dynamics. This class will build and expand on Basics to improve their grasp on the art of conversation with horses using their language with a focus on improving listening and communication skills. Building Fluency is an advanced class for students who are independent in their communication skills and desirous of going to another level. Class size will be small. All students will handle horses independently to refine communication techniques with a focus on developing fluency.